Tuning the Madstad 20" screen for a 6' Rider. Trial and Error. I bought the 20" system for my 2013 and spent some hours going up and down the highway trying different setups in hopes of finding the fabled "perfect bubble". After playing around with my Madstad screen I'm making some progress. Thought I would share my experience for those who might be looking at the Madstad setup. Windscreens are expensive and a lot of times you don't know what works until you try it. So maybe someone will find this helpful. I'm 6' tall and my bike has 2" Rox risers tilted back to put me about in the middle of the seat, if not a little further back. I have pretty good posture, and try to keep my shoulders from rounding and my head up. I found that the screen is best in the highest position with the screen tilted towards me one notch from the most allowable. (The new brackets now have teeth that give you one of 8 or 9 rake positions). I got a lot of turbulence in every position until I switched to a sun-visorless helmet, going from an Arai XD-4 to a normal street bike helmet. Now, with the street helmet, and helmet closed, I get zero turbulence at 55-65mph on the highway and very little noise. It's doing its job. When I flip the street helmet's screen up at 55-65mph, the turbulence is very strong. When I close the helmet back up, boom, back to quiet again. So where is that air coming from? Down low. I put my hand in the gap under the windscreen between the beak and the screen and I can feel a lot of air coming up from the bracket area. I know Palmer sells a baffle to stop this on their bracket system, so I thought about doing some testing. Today I blocked off the air from that center section (similar to the Palmer baffle area) and did a few highway runs with my helmet open and closed. This blocked all of the area from that center section, obviously, but opening my helmet at 55-60mph still brings the turbulence. Passing my hand over that center section at speed it felt calm, no air coming by, but there is probably still a lot of air coming around that center section. I suspect that maybe the air coming from the right and left sides of the bracket legs (to the right and left of where the towels are) need to be blocked as well. The 20" screen in the highest setting, tilted back, can get me super close to the "perfect bubble". The only issue is that it only works when my helmet is closed. Also, the screen is not impeding my field of view. I don't like to look through my windscreen nor have it right at my eye level. It's just low enough that I can easily see over it and it's working well when the helmet is closed. 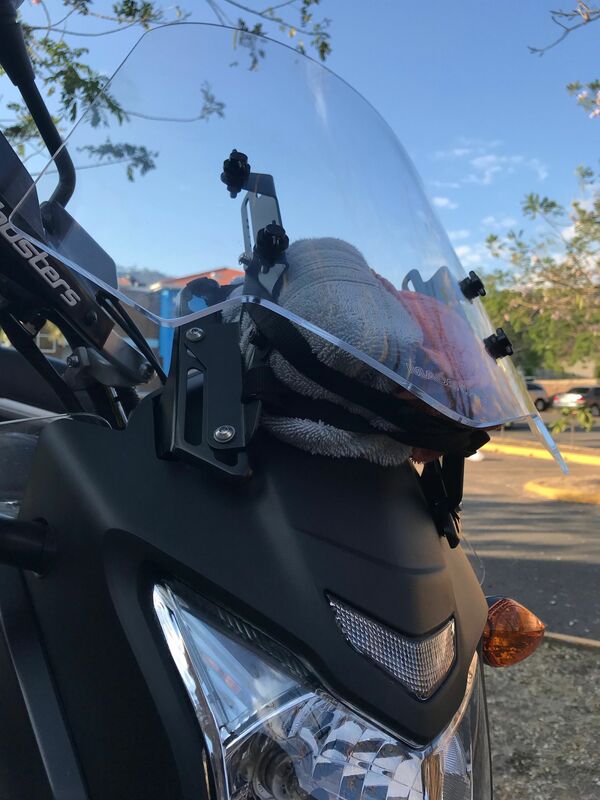 I need to figure out how to get the same bubble when the helmet is both open and closed, as I mostly ride with the helmet open here in Honduras. I'll keep experimenting with towels to block off the other parts, and if it works I'll have a local welder make me some kind of block off plate to attach. On a side note, I don't care for how the screen flaps around on the Madstad bracket. It's stable enough to hang on, but man does it dance. 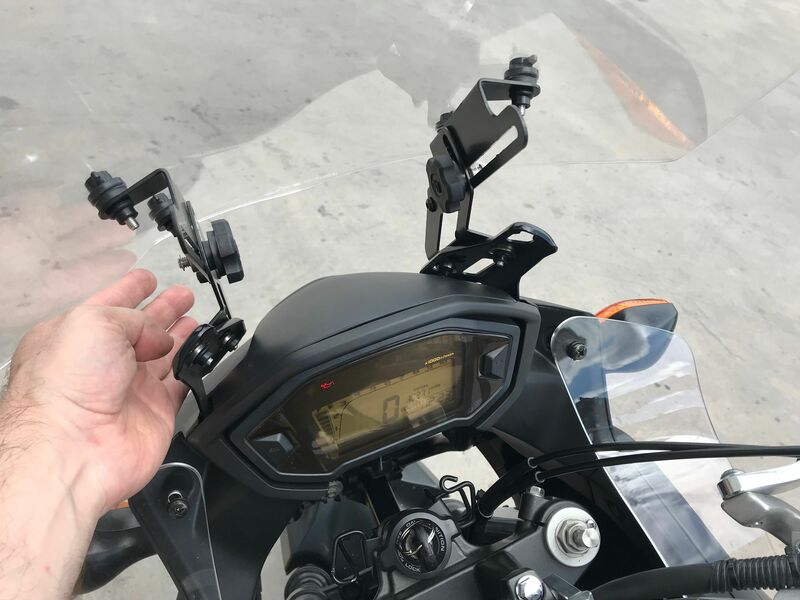 Another thought is to switch to a taller Puig or Givi screen that mounts directly to the OEM windshield brackets and if I need to add some height (similar to the 20" that the Madstad gives me), I could add the Bruut brackets to get the height. There, it would be mounted closer to the beak area and perhaps the turbulence caused from the air passing under the screen might be substantially less. Will post an update as it comes along. Re: Tuning the Madstad 20" screen for a 6' Rider. Trial and Error. Six feet and 34" inseam also with my 20" Madstad adjusted a bit lower for best but just mediocre results...same as your helmet description. Better than stock, tried all possible Madstad positions, but much room for improvement. Been thinking the side deflectors could be an inch longer. Was thinking of a custom bracket to only allow 3/4" air gap as I think the Madstad bracket air gap is excessive. Also had to grind a contour for hand guard clearance on the sides of the screen. I might take some thin plywood or plastic and make some alternate shapes of screen to try. I also think the bracket shakes way too much and is flimsy on gravel roads, especially washboard bumps. I can only give this design a "C" grade. The Africa Twin forums talk of an air can in front of the tank to block buffetting air coming up the fork tunnel which could be tried on the CBX. I've got 2.5 more months of winter before any experiments can begin though. Very interested in your results. Going through the same process with CalSci, which I’ve just had cut down a bit and (the current favourite) Puig. Do those winglets on the side of the tank come with the Madstad - if not, where did you get them? It's quite a process, I know. After finding what works with my helmet closed, I'm optimistic that I can figure it out with the helmet open. Definitely agree with you on the design, it's flimsy. I can't imagine how bad it would be off road. My friend recently got an Africa Twin and now that you mention it, he was saying that same thing about blocking off air in the tunnel. I havent the even looked at that area as a potential problem. Thanks for mentioning it. They came with the Madstad setup, but you can order them individually. 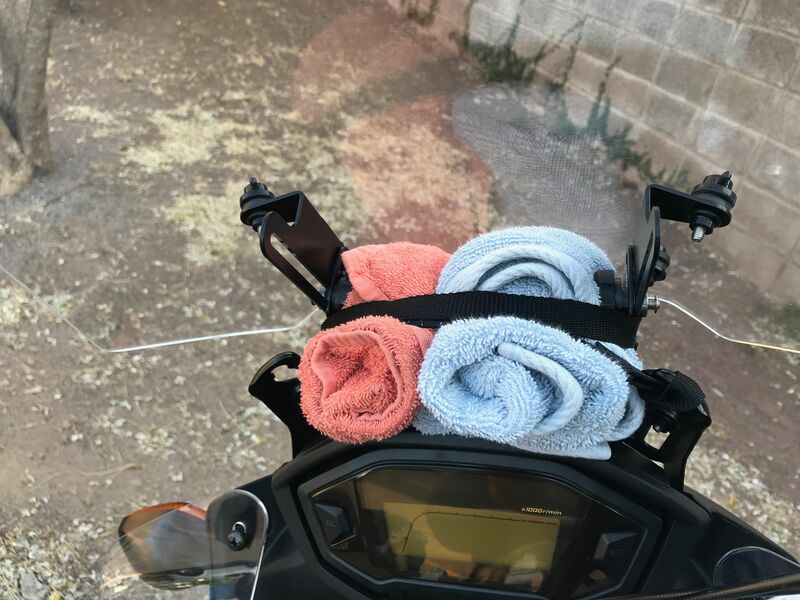 Many folks on the Africa twin forums are installing air deflectors over the hole coming up between the forks and the tank - and claiming much less turbulence behind the screen. We might also give that a try. p.s. now I see that someone else has pointed to this direction too. Thanks. I took a long look at that tunnel this morning before my ride to work. There really isn't much space to move around in there, it's all pretty tight. On my ride in, I took a few seconds to feel for air coming up through that area. It's really minimal, like practically nothing at 55mph. After having slept on it and talking it over with some friends, I'm beginning to think that I'll look into going back to a system that mounts to the OEM screen brackets. Now that I know the degree of rake the screen needs and the height to get a comfortable ride with my helmet closed, I can replicate those two, height and rake, with a different screen. 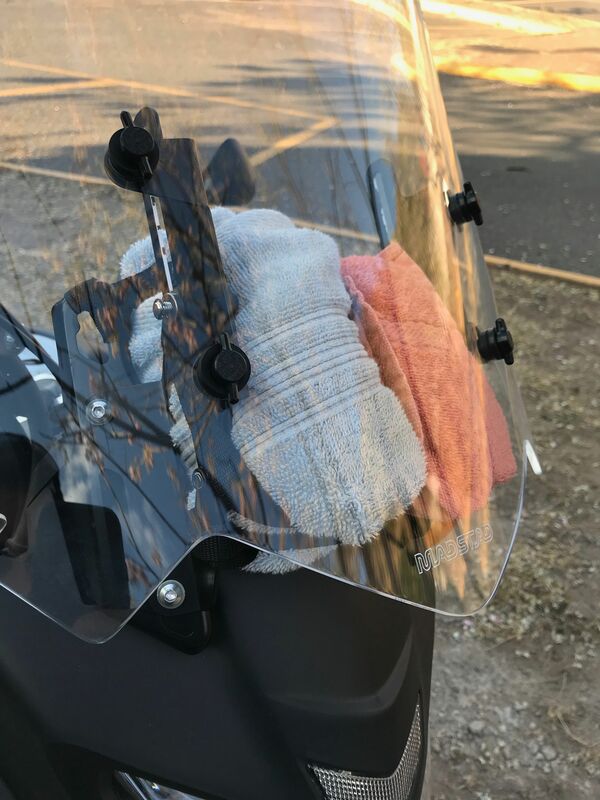 I'm looking Givi and Puig screens, both are in the 19" range, and mounted in the "high" position on brackets will give me around the same height as the Madstad in the highest position (which works when my helmet is closed). This setup will substantially close the gap between the bike and the screen. Then, I can use some weatherstripping or some other solution to block off the bottom area if I'm still getting too much air coming from under the screen. Crowd sourced wind tunnel testing session anyone? Seriously, the number of riders (especially adv types) that complain about buffeting is incredible when you consider how much money some of this machinery costs. Would a car manufacturer get away with a vehicle that hums terribly at a certain speed, or knocks the drivers head around when you open the window? Considering the fatigue it induces, you could argue that a badly designed screen is a safety issue. How difficult would it be to knock up modelling software and test according to different scenarios, rider position, etc? According to the level in my iPhone, the Madstad screen is creating the "perfect bubble" with helmet closed is at a 40 degree angle. Madstad recommends 55-60 degrees. I have tried a more upright angle and from what I've seen, it doesn't work for me. I'll look into the 60 degree setting over the weekend when I have more time. Yesterday, I tried the rolled towel blocking setup with the rake more upright and it yielded turbulence with the helmet closed. I dropped it back down to 40 degrees and got my "bubble" back. Today I measured from the top "high" mounting holes to the top of the Madstad screen. I got about 13.5". The 2016+ factory screen is 9" from the top mounting holes to the top of the screen. So, it would appear that if I had the 16+ factory screen + the Bruudt bracket (+2" gain at it's highest) I would have 11" of height from the "high" mounting holes to the top of the screen. That's 2.5" lower than what's working for me now with the Madstad system. I was hoping that I could get the 13.5" from the OEM screen as it's only $55 on Bikebandit. Puig and Givi screens are considerably more. The next test is to lower my Madstad screen the 2.5" and see how it works with the helmet closed. Another thing to think about is that the Madstad moves the entire screen towards the front of the bike. If I were to mount the screen directly to the OEM brackets (no Madstad bracket), will it still create that "bubble" with my helmet closed with 13.5" of height? 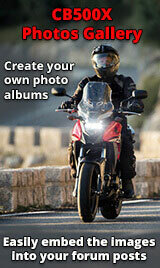 Or does moving it closer to the rider onto the OEM brackets change everything? In essence the screen will be closer to me and therefore might need more rake to get it to kick up and over my helmet. I measured the angle of the OEM brackets on my bike. They are at about a 55 degree angle (in line with what Madstad recommends). So maybe that'll give me the rake needed to throw the air up over my helmet. The next step is to block off under the screen some more with additional towels and see if that makes any difference with the Madstad system. If I can't stop the turbulence with my helmet open, I'll be moving on from the Madstad system. If you get a chance try blocking air with the towels on the right and left lateral screen sides with an open air, fist size, channel at screen center. A nice air deflector could be fabricated there if it worked. I also think the Madstad works well until 55-60 mph but the 70-80 mph is another league of difficulty. I thank you from my "winterland no test zone" .